PAS lines up with Tesco’s about taking goods home unseen! 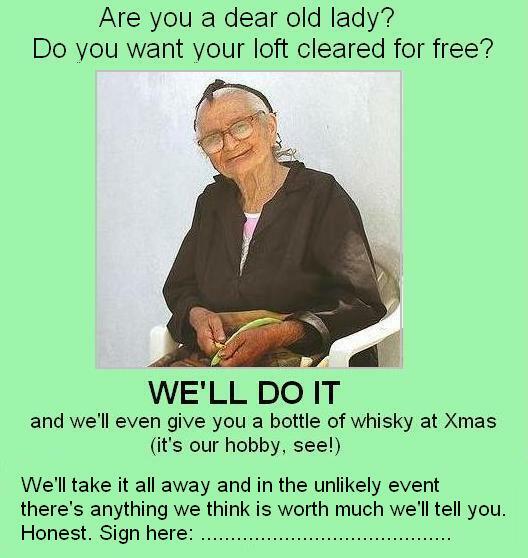 If you visited your Granny and she showed you this flyer and said two nice young men had emptied her loft for her last Tuesday how would you feel? You’d be angry no doubt, especially if she said they told her there was nothing but rubbish and she hadn’t heard from them since. Yet it’s a fact that the wording of that flyer encapsulates the essence of the National Council for Metal Detecting model search agreement which thousands of detectorists get landowners to sign! If the flyer is intolerable so is the agreement. We’ve been saying as much for years but very recently we’ve gained an ally. The Portable Antiquities Scheme is to advise landowners to “ask to see all archaeological finds” . It’s the equivalent of the Government or police warning old ladies not to agree to let someone take things away unseen from their loft. So, if you’re a landowner who has ever signed an “I needn’t show you everything” agreement we suggest you cancel it now. Ask for a “PAS compliant” one instead. It’s an inescapable fact that not showing everything before going home is unacceptable behaviour – both we and Tesco’s have said so for years and now PAS says so too.